My udon and mochi at Tacoma’s Buddhist Church during their Fall Bazaar were delicious and my husband said his miso soup really hit the spot. Our meal was served by the nicest volunteer waitstaff and our tea was topped off on a regular basis. Really the fall festival was a positive experience. 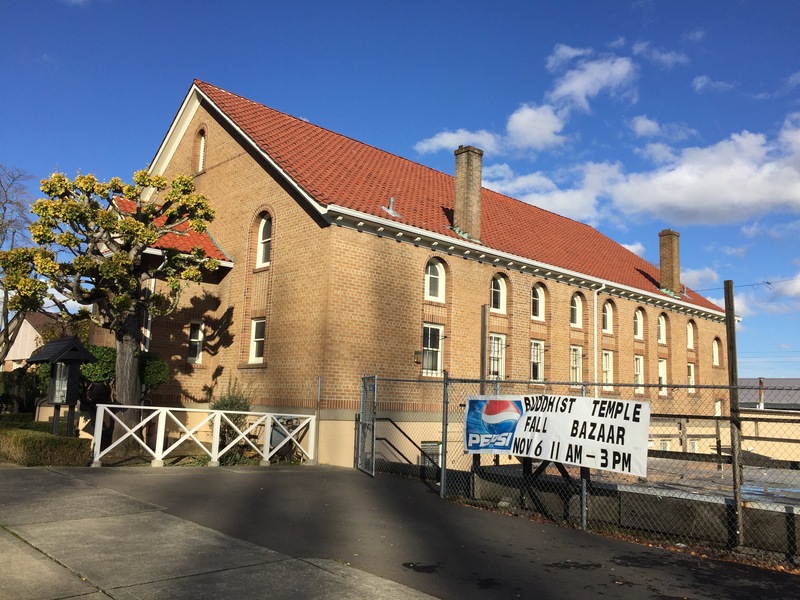 The Buddhist property at 1717 Fawcett Avenue, in Tacoma, is sometimes referred to as a temple and sometimes as a church. The building, which features a lovely red tile roof and stone lanterns flanking the main door, was originally constructed in 1930 for its current use. It is listed on the city, state and national historic registers. One interesting note to the building’s history is that it was closed in May 1942 for the duration of World War II. Many of the members of the congregation were sent to Camp Harmony (now the site of the Puyallup Fair) and the leader of the church taught Sunday School at the camp. The camp was a detention center for Japanese Americans during the war. Luckily that time is behind us. This entry was posted in Places of the Spirit, Tacoma, Temples, WA State - Pierce County and tagged bazaar, Buddhist, Camp Harmony, Church, fall, Fawcett, festival, Great Udon at the Tacoma Hongwanji Buddhist Church, Japanese, lunch, miso, mochi, soup, Tacoma Hongwanji Buddhist Church, Temple, udon, WWII on November 7, 2016 by admin.